As per usual, due to the feedback and response from the network and of course due to, unfortunately, misuse by some individuals in our network, the double XP policy has had the following changes made to it that are effective as of the date of this posting. This is not to indicate that ever one in the CCS network was abusing the policy or finding loopholes they could abuse to make the double XP program a negative experience for the player base, many sims and sim chains used it responsibly to award their communities and enhance events but as per usual a few bad apples spoil the whole barrel so all adjustments are prefaced with NEW: to indicate that this part of the policy has changed. L$25000 - 24 hours of double XP for your region or chain. L$50000 - 48 hours of double XP for your region or chain. L$75000 - 72 hours of double XP for your region or chain. You cannot exceed 72 hours in one double XP scheduling. Also you cannot schedule double XP to end or start the day before or day after a free full network double XP period. There must be at least 24 hours of normal XP rate in your regions between your Double XP Scheduling and any network wide double XP period. NEW: You may only schedule one instance of double XP for your region in a 30 day period. Just one scheduling as of November, 2010, is what will be allowed. I had intended to return to two in November but its obvious we need to scale this down some, so one scheduling, per community/sim chain, per month. You MAY NOT take 3 sims in a chain and schedule one event each week of a month for each sim in the chain, if scheduled, it pertains to all sims in a chain or community group, if you choose not to activate certain sims of that chain for that month, then they will be counted as having been part of your double XP scheduling for that monthly period regardless of having been included or not. NEW:You may not advertise Double XP for your region in the CCS Events group as it if it, by itself, is an event. Double XP is NOT an event. The intention is to support and draw more attention and interest to events and RP you may be running. You may advertise events going on in your sims during your scheduled periods but you may NOT, at any time, advertise double XP or advertise it offhand by adding a link to a double XP access group in your events advertisement. Double XP from now on can not be ADVERTISED IN ANY FASHION IN ANY CCS GROUP. If CCS is in the group name I don't care who owns it the group it is an official CCS group. Closing Sim to Group Only/Charging for Group Access: The MAXIMUM group access fee allowed for attempting to recoup costs or dissuade campers/griefers is 500L, anything more than that will disqualify your sim from the scheduled Double XP period. NEW: Multiple Double XP Groups: Use of a toll booth method of double or triple charging individuals to move from one sim to another in a sim chain by having a different double XP group for each sim in the chain is NOT ALLOWED. Sims found doing this will have their double XP canceled without refund and will be liable for refund of all group join fees collected for their scheduled period to all players that paid into the group. You may only have ONE Double XP Access group per CHAIN of sims, period. CCS will be accepting scheduling for Double XP periods as of today, again, under these new terms. First dates of availability start July 1st, 2010, all payments for Double XP Periods must be paid at the time of scheduling with the administrative entity that handles your request. At this time only Suzanna Soyinka and She Juniper are authorized to accept scheduling for Double XP, and you must contact one or the other to schedule the times you wish for your communities. I am hoping that this allows the CCS network to once again take advantage of being able to provide slightly elevated experience for their communities to help promote the RP and events they do within their communities and that this allows the lower levels within the network to pick up and become more powerful within the game and be more competitive with older, higher level players, more quickly. Double XP has its good points, one of them being CCS being able to finance its endeavors. But I personally made the choice to cut our profit intake on Double XP as it was because of how exploitable it was and because it was being abused. I have put 9 months of development into not only making our game better, but also making it more secure so we could return this feature to the sim owners in a fashion which the system itself would discourage the exploitation that the community was having such a problem with. I hope everyone takes that under consideration here. I ate all our costs, paying Melanie, sim tiers, bandwidth, server costs, legal costs, and I did it all without Double XP running, so while Double XP does allow CCS to make a fair profit, I took all of that away and again, shouldered much of the financial burden for all this to try to make it RIGHT for those of you that had problems with it, and try to make it right for the network so it was a benefit and not a detriment. Keep that in mind when you consider the new policy. I chose to not make money I had every right to continue making, to make good with the community on this policy. And to meet the communities concerns with the previous policy halfway. Starting Statement: We've been dealing with this stuff now for about four years and I've always more or less expected admins and GM's to award XP for role play in what I believe is a common sense fashion. As we have grown over the last four years these explanations have become less clear for some, others have just never heard of them. I have conversations with some on the issue the relay what I've said to others, and in large people become confused because there is no hard set, clear cut, documentation in regards to it. XP Cannot be awarded for standard SL style events, Best in Black, come dance to our DJ stuff. Standard Linden Cash awards are still what you must used in the case of OOC, non-role play events. XP cannot be awarded as "payment" for services rendered, I.E. paying GMs in XP for being GMs in your sim, paying a builder in XP for building in your sim and so on and so forth. These are OOC activities and volunteer activities and are not subject to "payment" in any "CCS" based currency currently in existence or that may exist in the future (currently the only "currency" of CCS is experience this will change in the future.) Payment for "services rendered" if required must be done in normal fashions via Linden dollar or in another arrangement between the parties involved. CCS based Tournaments are limited to a total of 10000xp per 30 day period per CCS community, notice that says community, not per sim. Some communities are one sim, other communities are 20 sims, thus if it were per sim, the 20 sim community would have 200000xp if we allowed it per sim. So its per community, 10000xp total, every 30 days. It does not accumulate and if you don't use it in one 30 day period, you still only have 10000xp for the next 30 day period. All XP awards require documentation on the database player record as to why they were given, you must give some kind of qualifying documentation to justify awards given out. As stated these were considered "common sense" based daily RP/small RP awards but there is much confusion in regards to them. So we are giving the "rule of thumb" documentation here so this is more clearly understood. Other things that fall under this category are unobserved RP's that are handed in via note card from a player to a GM(GMs and sim admins are NOT required to award XP for note cards handed to them and it is left to their own discretion whether they will accept note card based scenes for award consideration or not, some GMs and sim admins currently do, others do not. ), and sim wide spontaneous "monster hunt" RP's where the entire player base currently online in a sim bands together to take on one large GM designed NPC. 100xLevel: This style of XP award is applied to large scale RP's in participation of sim wide coordinated or spontaneous events that last for a duration of time and the player interaction with that event has been substantial. It means you take 100 XP, and then multiply that by the level of the player, and thus, you get their appropriate award. For a level 1, it would be, obviously, 100xp, which is substantial and appropriate for a level 1, for a level 50, it would be 5000xp, which is substantial and appropriate for a level 50. 100xLevel cannot be applied to tournaments, small/daily RP, monster hunts or "clan wars". It is only applicable to large scale sim role play event participation. Hopefully this more logically explains the XP awards situation for role play in regards to what is expected from the CCS administration. And what we feel is logical and appropriate depending on the level of the players involved and the circumstances of RP as they occur. I will be "localizing" this document with French and Spanish versions via Google Translator, please forgive me if Google Translator screws it up in any fashion and feel free to send me corrections if you find errors in the translated versions. Strength - Strength controls the players overall melee damage output, and has some use in bashing in doors and breaking into places that may be locked. Fortitude - Fortitude controls the bonus to a characters overall Health. Willpower - Determines a characters overall chance to resistance a status effect placed on them by another player. Perception - Perception controls the players ability to dodge incoming ranged attacks and damage. Finesse - Finesse controls the players ability to dodge incoming melee attacks. DAZE - Daze causes a character to be unable to move. They may still attack while dazed, but cannot move for the duration of the effect. CURSE - Health/Stamina Regeneration is halted, melee damage is reduced to 0. POISON - Health steadily decreases throughout the duration of the poisoning. WEAKENED - Melee attacks will only hit for 1 point of damage for the duration of this effect. CONFUSED - Melee attacks go wild, possibility hitting unintended targets. BERSERK - Your character loses control and will wildly attack the nearest target, dealing immense amounts of damage to friend or foe. ARMOR - Armor mitigates damage by a matching its value to the value of the damage recieved, if the armor value exceeds the damage value, the damage is ignored, if the damage value exceeds the armor value, the difference is taken in damage. Armor comes in several versions, but Tank archtypes have the strongest armor of all the archtypes. BUFFED - Buffs give a variable amount of increase in melee damage output depending on the buff in use, DPS classes have the most efficient and highest damaging buffs available. HoT - Heal over Time, this effect causes you to gain health at per tick intervals based on the base value of the heal. 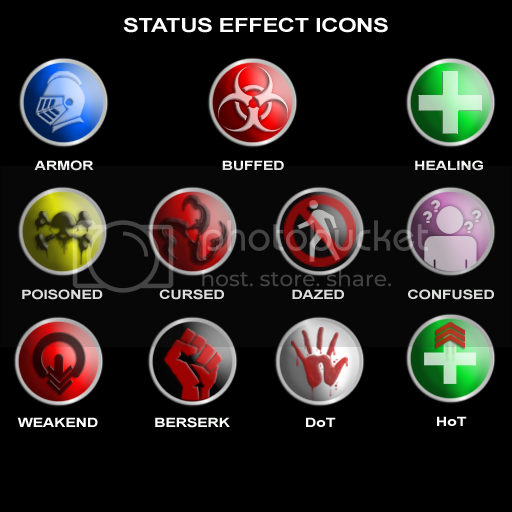 DoT - Damage over Time, this effect will cause you to lose health or stamina, on a per tick interval, based on the original value of the DoT base damage, they can be very debilitating. Currently have set a mandatory respec for all Lycan players as I've added two Rage 4 variants now, one for Lycan Stalkers and Brutes, which is set at +47 buff to damage as originally designed and another for Lycan Shaman/Werelocks that is set to +27 buff to damage to balance these two classes. Cyborg Mechanized has been reduced by 45% per version to put it in line with Tank base Adamant passive damage increases. Seraphim Redeem numbers did not show as too out of joint in the skill base so I'm leaving them as they are for now, will continue to eyeball this. Demon Malice is being reviewed for adjustments as its currently negatively affected by the new post 1.0 resistance schema, will update on changes once changes are made. In response to some problems that have been introduced by the new Linden Lab server version which appears to have once again introduced a speed limit without actually telling anyone they were going to, which was causing linkmessages sent between scripts on rez to get dropped if they were being sent faster than a certain rate on rez, I introduced a couple fixes and got some testing feedback from one of our third party devs that originally reported the problem, the fixes appear to work so we're pushing a new meter in response. I though, personally, hate pushing a new meter simply to fix a Linden introduced problem, but as the current feaures we're working on aren't ready for release and I don't want to leave CCS in a bugged state, and everyones been so patient with us as we get the new web features worked out, I'm issuing a free global respec to the network with this meter release just as a thank you to all the players. You may use it or keep it til you want to use it, its up to you. Okay after a couple of months of work we've killed pretty much all the bugs added a few features, tightened up the CAPTCHA anti-camp system and improved system performance in many ways. So heres the run down on whats coming. - Meter GM Functions will now no longer become unresponsive after one or two uses in world. - Fixed an issue where lag would cause meters to be able to send an ability two or three times before the cooldown timer was enabled. - Fixed a problem with XP awards/docks being issued from the database were being overriden by the meter XP total instead of being applied by default. - Re-enabled some caster class abilities to be used from 30 Meters by adding more advanced communications selection usage based on absolute range of the skill as it is set. - Fixed an issue with some legacy /9 commands and /666 commands that were still in the codebase which allowed for exploitation of certain meter functions, these commands have been removed. The commands removed are /9 off, /9 on, /9 reset, we left in functionality for /9 commands so you can create categorical gestures as needed. All legacy (CCS 0.3.0 or previous) /666 commands have been removed entirely. 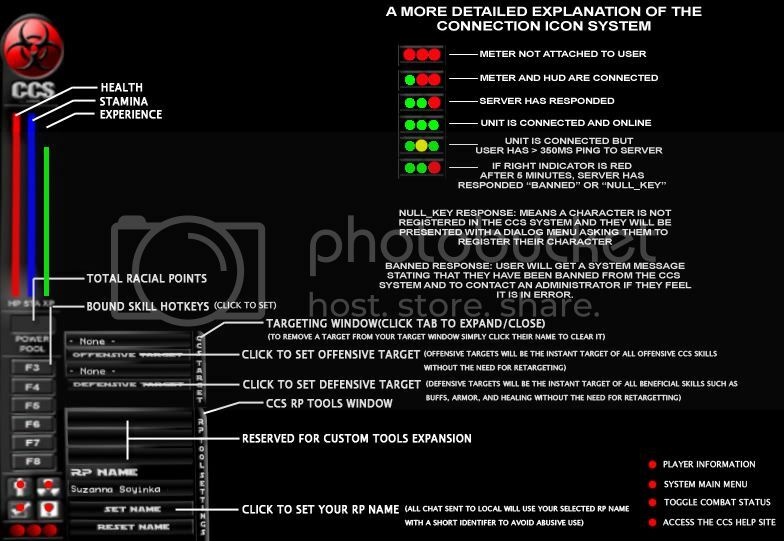 - Guard will no longer pass to offensive target if no defensive target is specified. Guard will only pass to defensive targets or selected targets and is not applicable to Offensive Target in any way. - CAPTCHA system has been strengthened allowing for dynamic adjustment of the CAPTCHA challenge/answer logic from the database level, allowing us to change the logic of it at any time to ensure we guard against viewer compiles and hostile 3rd party software designed to defeat it. - CAPTCHA system now notifies GM's of the difference between someone hitting the wrong number, and completely being unresponsive, no longer requiring GMs to check on people who simply mistakenly hit the wrong number. - CAPTCHA system has had its answer and question process seperated, the answer to the question on the dialog is stated in System Message in your chat box, you will have to check there to get the right number. - CAPTCHA system now properly notifies the individual that they have answered the CAPTCHA challenge correctly and may return to normal play, rather than leaving a user to wonder if the system has worked. - CAPTCHA challenges should occur less frequently and be properly postponed by combat activity, but will still, regardless of combat activity, send a CAPTCHA challenge within 15 minutes of being postponed by combat to ensure against damage based CAPTCHA avoidance. - Combative and Non-Combative states now give a clear chat message indicating when a user has set themselves to combative or non-combative. - Natural Revives now give a clear chat message indicating that a user has revived naturally after a 5 minute period of unconsciousness. - Race has been removed from the Hidestats feature of the meter, you are no longer forced to reveal your race on the meter while your stats are hidden. - Added database and meter based functionality for the new API percentile damage system, allowing for the API weapons market to start designing weapons that are equally threatening to all levels based on the weapons enhancements alone, making fights more skill and experience focused and not always a case of he who has the biggest weapon wins. - Increased range to 30m on major caster damage payload skills. This does not apply to Hex or Lifetap which still require a 20m range. - Balanced the DoT portion of caster and healer DoT's to reflect their post 1.0.1 base damage, the DoT effect values were still hitting for the original pre-1.0.1 DoT values where the base damage had been reduced by 36%. - All Skills affected by Intelligence or Strength Modifier now have their "Damage to Target" numbers reflected as +var+ (Base), any damage number with (Base) at the end of it indicates a skill's damage will vary depending on pertinent stat investment. - Tweaked Chance to Hit for all secondary status effects, status effects should now hit far more often. Please inform us if they're hitting WAY too often. - Added T7(Level 65/70) and T8(Level 70/75) abilities where appropriate. - Increased Point cost on Malice to 3 points, reduced cooldown to 30 seconds, added intelligence point modifer on base damage hit allowing the damage to scale to the intelligence score of the user. - Increased cooldown on Hex to 25 seconds from 15 seconds due to its multi-class usage. - Reduced Radshot Cooldown to 25 seconds from 45 seconds. - Reduced Redeem Cooldown to 10 seconds from 30 seconds. - Smite base damage now scales with player intelligence score. - Virus Cooldown reduced to 25 seconds, base damage now modified by intelligence score. Fixed issue with Virus 5 and 6 being reversed in the database. - Warcry Cooldown Timer reduced to 30 seconds, duration of status effect reduced to 20 seconds. - Wrack base damage now scales with intelligence of the user. - Wrath Cooldown reduced to 15 Seconds, Intelligence now affects the base damage of the attack. - Gave Lycan Shaman and Werelock's Rage-4, Rage-4 has a 120 Second Cooldown as it is usable by all Lycan classes. - Added new caster ability Decimate, this offensive ability destroys invulnerable shielding on a target, stripping it and making the target vulnerable to damage once more. - Healing Category Abilities have not been touched, I feel they heal for plenty already, and healers have a ton of abilities to pick and choose from, healer T7 abilities will be Archetypal capstones from level 79 to 90. Least for the moment. If tweaks need to be made I will make them but right now adding higher numbers in the healing category for healers or any other class, makes no sense with the addition of the T2, T4 and T6 Racial Regens now added. - CCS Meters will not autodetach at 2048m in altitude as scripted, they simply stop working, and cannot be detached until the user is back under 2048m, we believe this to be a SL Server issue and we are attempting to work out where the problem is with this rather simple llDetachFromAvatar function ceasing to function at its established height. - SL2 Viewers depending on viewer and browser combonation are occasionally sending user data URL strings on registration and level up with a question mark at the end of the user name, this is a SL2 viewer specific issue, we are working on parsing the question mark out of the string server side, but it has nothing to do with the data the meter itself is sending from its scripted functions. Its some odd bug in relation to SL2 and certain browser combonations. - Repeatedly spamming an ability key to try to get it to fire multiple times will cause a meter to throw an http error and the functionality of the skill category being spammed will be subjected to the cooldown timer of the ability. This does not affect the system other than causing the ability you're spamming not to work, and forcing you under a cooldown for it regardless, so please, stop key spamming and just hit the hotkey for your ability once. Otherwise you will error the ability, this is not something we can fix for you. A Global Free Respec has been enabled for this release you may access it by accessing your player profile and respec your character as needed to adjust for the new changes. - Caster Hex Skill damage base modified downwards to adjust for intelligence modification, the new base hits are lower, to adjust for the high damage output high intelligence can give. - Players recently GM revived will immediately die again if they use a skill before the next "tick" save of the meter. This is because defeated/death states are immediately saved to the database, revives are not, please ensure once you are revived you wait at least two minutes before attempting to rejoin combat until we resolve this. - Meter skills will stop working if you are in an area with a player with a name with more than 24 characters between their first and last name…work around is to get a fresh meter, this is already fixed in my meter and will be released with the bugfix release coming soon. - Campers have found something we neglected to consider as a way to get around the anticamp system, its not very lucrative as it causes them to lose XP as well as gain it, regardless we've already broken that in my meter and it will no longer be an option once the bugfix release is put out. Caster Intelligence Modifier passed to caster offensive skills, some skills such as Lifetap and Reave are static value skills and are not affected by intelligence. Meters menus will occasionally stop working (GM tools, skills menus), this is due to a quiet stack heap collision error in the menu_engine script which basically renders all menus inactive, the work around fix for this is to just get a new meter, the cause of it is the meter targeting sensors attempting to parse player names with more than 24 characters such as Superstupidlongnameavatarperson Schollingscheiwshauser….no offense to people with names of that size, we're currently working on a truncation fix for that script and expect to have it within the next few days. Anti-Camp system occasionally behaves oddly on first login or reattach, we're working on that too, we're also looking at extending the timer and narrowing the random factor somewhat so it isn't as randomly invasive to some players and not to others. We're also making an extension of the timer that governs the combat delay for it. On the 2nd of April I made adjusments to the points divisor to allow Fortitude and Endurance to create a bit more health and stamina per point invested to make the 5 point per level adjustment, I've created a new poll on The main website to get the user bases feeling on the adjustments made. Please cast your vote. Player levels have been CAPPED at level 90, that is the final level in CCS, every level from level 79 to 90 costs 1 million XP per level to attain. Every level between level 80 and level 90 with be awarded with extremely powerful artifact ability of the class/race of the player that is unique to that class and race and shows the true power of the most powerful players of a race/class in CCS in an absolutely awesome fashon. Player statistics in CCS have been completely overhauled to make stat development more definitive to the performance of your character, in previous versions of CCS some stats were more effective for performance than others, some had no use at all for some classes, in 1.0.1 all the player stats come into play and have use for all classes. Also under the 1.0.1 release we are enabling an enforced GLOBAL RESPEC under the new 5 point per level stat assignment rules. Previous to 1.0.1 we were giving 6 points per level for statistical investment which was allowing people to max out too many stats at the high end of the game, the original plan was to reduce this to 4 points per level but this was deemed too drastic in beta testing, so we have settled on 5 points per level to reduce the statistical pools of the player base across the board and enforce more focus on balanced stat development. If you use the old logic of "max out fortitude and endurance then put everything else in willpower and perception….you will get mangled by skill damage and you will not have any noticable melee damage output. Every stat now has serious effects on your combat capabilities, ignoring any of them will leave you with a huge exploitable weakness that won't be hard for people to figure out. With this change depending on how you allocate your stats expect to see around a 15% to 30% reduction in Health/Stamina across the board. But also expect to see vast improvements in skill damage output, healing output and melee damage output, and damage mitigation as well. We also changed stat based damage mitigation heavily. Previous versions of CCS only really saw much damage mitigation worth from Perception and Willpower. Damage mitigation is now split across four stats. Please ensure you understand the stat descriptions so you understand how damage mitigation has changed, also be aware that regardless of how much you invest in these four stats, the maximum total damage avoidance that can be reached via all four is 33% for each damage type mitigated by each stat. Fortitude - Fortitude controls your bonus health awarded per level. There have been no major changes to this statistic. Endurance - Endurance controls your bonus stamina awarded per level. There have been no major changes to this statistic either. Intelligence also governs skill damage mitigation for all classes and races and allows for up to 33% resistance of skills used against you. Perception: - Perception now controls a characters ability to dodge or avoid ranged damage from guns and other projectile weaponry, as per all other mitigations, this skill caps at 33% total resistance for all classes. Finesse: - Finesse is a new stat that splits the old Perception stat mitigation into seperate categories. Finesse controls how dexterous your character is in melee combat and how capable you are of avoiding or dodging melee attacks used against you, as per all other mitigations this skill caps at 33% total resistance for all classes. Resistances are Class Configurable: Even though we've currently set all resistance stats to a cap of 33%, this is now a database controlled value, just like skill damages for skills, so if we feel during the course of play that certain classes require adjustments to their mitigation capabilities as a class improvement, we can make these adjustments on the fly at the database without having to issue a new CCS release and without you having to respec your character at all. So while 33% is the hard cap for all classes at release we have left ourselves the option to add class modifiers as needed, to damage mitigation, should we feel the game requires it. Due to the increase in modifier effectiveness from statistics and the minor reduction of player stat points in the respec, the base damage for all offensive skills has been reduced by about 25% across the board. We will be adjusting these abilities in live game time as needed but the stat based modifiers, with the base damage values for CCS 1.0 produced somewhat apocalyptic results giving one high level skill the ability to nearly kill a player of equal level if the associated modifier stat was maxed to 100 points. Adamant - Tank Class Passive: Adamant is a level 0 skill that all tanks recieve as part of their class, it does absolutely nothing active, as stated it is a passive skill, Adamant basically directly increases the amount of melee and skill damage a tank puts out directly in relation to how much damage they have personally taken. Going from stages of 100%, 75%, 50%, 25%, Tanks move from 1x Damage Modifier to 2x Damage Modifier at near death, putting their damage output on par with a DPS class when they've absorbed almost as much punishment as they can possibly take. Healers and Tanks may wish to work this mechanic together, allowing the tanks damage to increase, then using heals to keep them within a certain damage range, this strengthens the bond between healers and tanks to a certain degree, allowing for a combined tactical approach which makes both the healer and the tank a potent and threatening team. Guard - Tank Class Tiered Buff: Tanks can now place Guard on a defensive target, be it a healer or other class, the Tank can now render their chosen defensive target invulnerable to all damage types (but not status effects) for a short period of time, which tier of this skill increases its duration, Guard has been placed in the Healing category of Skills for Tanks to take some of the weight off use of the ability due to their large dependance on their support skills and offensive skills. Reflexes - Neko Racial: Reflexes has been completely reworked and is no longer dependant on Perception/Finesse modification to increase mitigation, as with the 33% cap, it would still be ineffective, Reflexes now gives the Neko character 45 seconds of total invulnerability to all damage types (but not status effects) on use. Feral Charge - Neko Racial Addition: Feral Charge is now available to all Neko classes and works somewhat similar to the standard DPS charge except there is a substantial damage hit should the attack hit, on the target, as compared to the standard DPS charge doing very little damage at all. Reave - Caster Class Stamina Drain: - Casters can now recover stamina from targets in combat by using the Reave ability, this allows them to replenish their own stamina at the cost of the targets stamina. The conversion rate is a direct x2 multiplier, if you steal 20 stamina, you get 40 stamina as a caster using Reave, this will vary with intelligence investment and closes the game between Healers with Overdrive and casters having no Stamina recovery method at all. Secondary Skillbank: - The Secondary Skillbank has been added to the main menu once more, allowing people to load up 3 more skills for quick access from the main menu itself, on top of their 6 hotkeyed skills. - Increased script base performance by about 100% of the 1.0 previous version. The system should be extremely responsive even in heavily loaded environments, some may complain that it reacts almost too quickly, being used to slower damage in heavier loads from previous versions. - Scripts refactored to handle a huge amount of new variables from the back end, allowing us to customize much of how things perform, not just the skills, from the back end, without needing to push a new meter version. - CCS system culled down from 48 total scripts to 20 active modules with inactive modules only processing data when called. - In our unending war on camping and exploitation we've added a new anti-camp system that cannot be fooled by movement, gestures, chat statements or even Windows Macro Recorder. The new system is fairly easy to understand once you see it, it will NOT interrupt combat ever, but is set on a random timer to generate a dialog asking you for a correct response within 10 minutes. Its all pretty straight forward, and the answers its asking you to provide are generated behind the CCS Dynchan so no amount of chat listeners are going to allow you to intercept this data. And, even if you could work that out, you'd then have to code a third party program that could scan your screen and somehow autorespond with the correct answers. So with this anti-camp addition, we believe the days of camping afk are over. I'm sorry if this was your favorite part of CCS, it definitely hasn't been mine. - We've added a new timeout feature on the non-com toggle which does not allow you to switch to non-com then switch back to combative without a significant delay. It was found that people were exploiting the non-com feature with a gesture that allowed them to switch it on and off so fast it wouldn't register a change visually, but while running said gesture they could take almost no damage at all. So theres another cheat fixed, sorry cheaters. - New system absolute ceiling of 2048m, CCS will now work up to 2048m above the ground in all sims. - Buff stacking has been removed entirely, the only value CCS will accept is the highest buff or armor value it has been given, if you use Spirit and armor yourself for 15 armor, and then use Resolute-6, the value for Resolute-6 will be the active armor value, it will not be Resolute-6+15 from Spirit. This applies to all buffs and armors including API enhanced weapons that give buffs and armors themselves. CCS will only accept the highest value its given, and thats it. All previous buffs or armors are overwritten. - Moved the GM Call Key off the HUD and kept its button in the main system menu, the Help Button on the HUD will now access this site for CCS information. - New Level Up Effects and Sounds! Goodbye wolf howl, say hello to my "ANTI-DING" level up sound. - Respec on demand, simply choose "purchase respec" on your profile, and for a percentage of your total experience you will be granted a respec to use, total percentage is still under discussion. - Secure XP Transfer: Need to start a new life? Don't want to lose all your CCS XP because of it? Secure XP transfer will let someone transfer the XP of one of their avatars to their new avatar, but, the old avatar is deleted forever and can never be reclaimed and the new characters record is marked as XP Transfered and cannot recieve any further transfers. - Tier 8 and Tier 9 Skills(These will be coming much sooner than the above two, I just didn't have time to knock them in today. If you find a bug, or an exploit or something you're finding unacceptable in CCS, please feel free to contact the CCS Support Group, and/or drop me, Suzanna Soyinka, a notecard, in regards to your concerns, what you think really matters and a lot of the changes made to CCS 1.0.1 are directly designed around the thoughts and concerns of the player base. So please, utilize your right to an opinion, send me your concerns, or voice them on the forums at The CoLA/CCS Website, what you think and your needs as the players and owner affiliates of our network is important to me, so make sure you let me know if anything concerns you or bothers you! © Gamma Wave Games, LLC. 2009 - 2010, All Rights Reserved Worldwide. This site is designed for optimal viewing with the Second Life in game browser. CCS Game Technology/Gamma Wave Games, LLC has no affiliation with Second Life or Linden Labs.